The race we all know and love, because after all; it’s us! Well, maybe not as strangely designed as these characters, but you get what I mean. In any kind of fantasy universe, it is almost imperative to have a human / humanoid race. Otherwise, us humans audience will have trouble latching on and identifying with characters. Because let’s face it, humanity can’t identify with a species that is nothing like us. And in this universe, humans serve just as much as a role in the world as we do in ours. This race in Yanside is the most societal. They are the managers of the most towns and cities in Yanside than any other race. They are the most all-around species, some being the most nimble, some being the most strong, and they all come in many different shapes, sizes and colours. I like to go the nth degree when it comes to designing the three latter points. Because that’s what makes each person unique in their own way. You can also notice from these designs that the era that Yanside is in is mostly celtic / medieval. And don’t let the title fool you; these aren’t the only humans in Yanside. They are merely examples of the race. And they also happen to all be villagers from Windagill Valley; Artie’s hometown. I felt it would be kinda interesting to have the humans be the victims of a kidnapping that a character from an otherworldly race has to rescue, because that might encourage the player / reader to be invested in rescuing them, as they are the same race as the player / reader. On a side note, I’m not going to draw every character from Windagill Valley for the sake of this website. That would just take too much time. 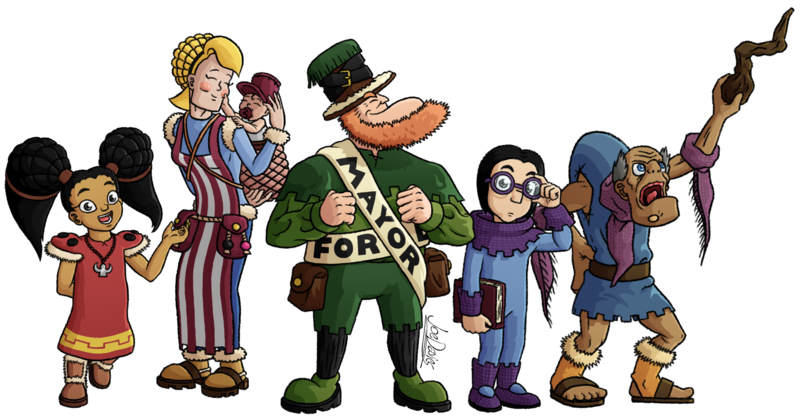 And these characters are more background characters than main ones, so it would be kinda ludicrous to draw and discuss each character in great detail. At least, under the time schedule that I have.